The Luning Formation at Berlin‑Ichthyosaur State Park, Nevada, hosts a puzzling assemblage of at least 9 huge (≤14 m) juxtaposed ichthyosaurs (Shonisaurus popularis). Shonisaurs were cephalopod‑eating predators comparable to sperm whales (Physeter). Hypotheses presented to explain the apparent mass mortality at the site have included: tidal flat stranding, sudden burial by slope failure, and phytotoxin poisoning. Citing the wackestone matrix, J. A. Holger argued convincingly for a deeper water setting, but her phytotoxicity hypothesis cannot explain how so many came to rest at virtually the same spot. Skeletal articulation indicates that animals were deposited on the sea floor shortly after death. Currents or other factors placed them in a north‑south orientation. Adjacent skeletons display different taphonomic histories and degrees of disarticulation, ruling out catastrophic mass death, but allowing a scenario in which dead ichthyosaurs were sequentially transported to a sea floor midden. twice that of the modern Colossal Squid Mesonychoteuthis. In this scenario, shonisaurs were ambushed by a Triassic kraken, drowned, and dumped on a midden like that of a modern octopus. Where vertebrae in the assemblage are disarticulated, disks are arranged in curious linear patterns with almost geometric regularity. Close fitting due to spinal ligament contraction is disproved by the juxtaposition of different-sized vertebrae from different parts of the vertebral column. 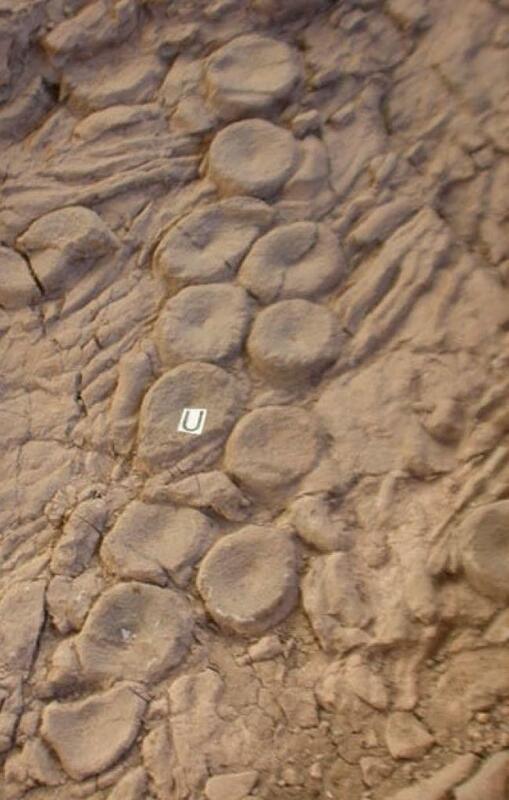 The proposed Triassic kraken, which could have been the most intelligent invertebrate ever, arranged the vertebral discs in biserial patterns, with individual pieces nesting in a fitted fashion as if they were part of a puzzle. The arranged vertebrae resemble the pattern of sucker discs on a cephalopod tentacle, with each amphicoelous vertebra strongly resembling a coleoid sucker. Thus the tessellated vertebral disc pavement may represent the earliest known self‑portrait. The submarine contest between cephalopods and seagoing tetrapods has a long history. A Triassic kraken would have posed a deadly risk for shonisaurs as they dove in pursuit of their smaller cephalopod prey.